My only thought of why, as déchetteries available to homeowners free, is that if 'deamed' commercial waste it would cost to dump it. 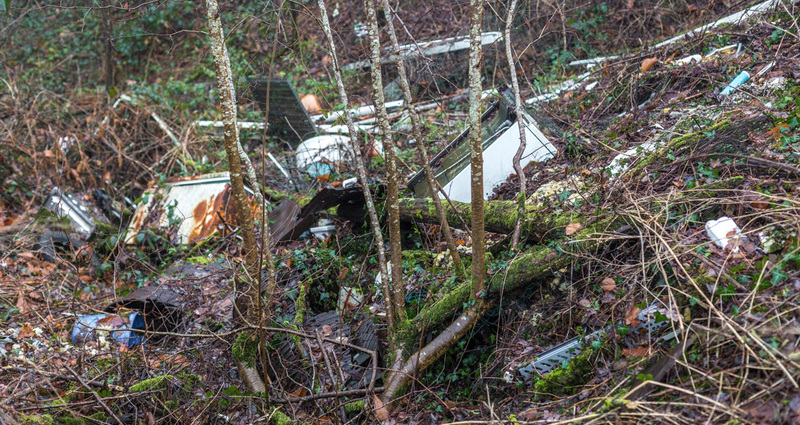 The cleaning up of these sites/fly tips cost councils mega money to clean up and it would be cheaper if they accepted stuff like this in the first place. This kind of thing is a common sight in the UK. It's one of the things that depresses me most about living here. Litter of all kinds, large and small, is everywhere, whereas I have found that in our part of France you rarely see any. As you say, it's baffling why someone would go to the trouble of driving out to a secluded spot to dump rubbish when taking it to the tip would actually be easier. I'm inclined to think that there is some kind of perverse pleasure to be had from spoiling other people's surroundings. Such a shame. I was on a walk in the countryside here recently and came upon the same sort of thing. THAT’S when I wish there was a camera! Same thing occurs in rural America. Worse even, the dumping of animals! Is the French sounding word junque a new English word or a new incarnation of the good old junk? potty, not sure how it works here, but I've not heard of contractors having to pay to dump. jean, hard to say why these things happen, but they do. mitch, cameras in the countryside? Big Brother will really be watching us! evelyn, that happens in France, too. It's sad. chm, it's just a joke spelling of "junk," as you suspected. Makes it all "fancy-schmancy."